After 9/11 and the anthrax attacks, we began to follow strict procedures for opening mail, including wearing gloves. One envelope had all the hallmarks of a suspicious package, right down the checklist of things to watch out for, so we called the HAZMAT team. They came in their insulated clothing and proceeded to soak the envelope with foam. Then they told us, “It’s fine—go ahead and open it.” When we did, we found a generous donation to the Society. Nothing suspicious about that! 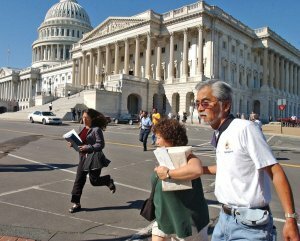 One last call for your Capitol Hill stories of 9/11 and its aftermath. Put ’em in the comments! Tuesday began as just another clear, crisp Indian summer day at the United States Capitol. Little did I know as I arrived for work around 8:45 am what this day would bring. I was the Legislative Director to Congressman Frank LoBiondo on the 2nd Floor of the Cannon House Office Building. After the first plane hit the World Trade Center, I had an eerie feeling and took a walk down the hall, headed outside toward the coffee shop in the basement of the Capitol. The one Capitol Hill policeman seated at the entrance on Independence Avenue seemed to be asleep and unaffected by the news reports. As I walked across the east front Capitol lawn I looked ahead in shock, as all of the doors of the building flew open and people began to emerge like birds being released from a cage. Several black SUVs rolled up to the covered driveway and quickly removed First Lady Laura Bush as well as Speaker Hastert. 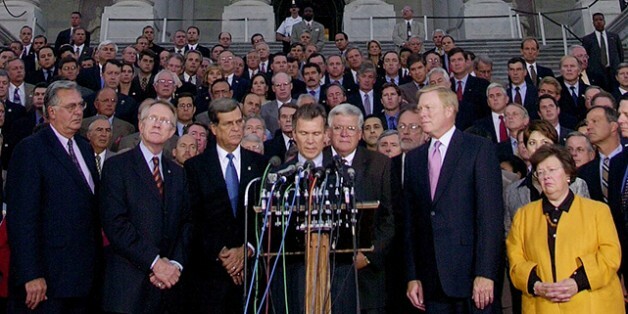 Roll Call recently published this picture from the East Front of the Capitol on 9/11. By this time, I was close to the Capitol steps but was told by Police to move back and get as far away from the Capitol grounds as I could. For the next hour, I stood on the sidewalk in front of the Supreme Court along with the Chairman of the House Intelligence Committee and several other Members of Congress, all clueless about what was happening. Police sirens were continuous, and National Guard trucks began to arrive on our street in full force. A lone messenger on a bike who was trying to deliver his lobbyist’s document to the Rayburn House office building was tackled by Guardsmen because he used some expletives when his bike was blocked in the middle of the street. A small street fight ensued but quickly was subdued. I witnessed what seemed to be a surreal filming of a Hollywood movie right in front of my eyes. We stood there and waited for almost two hours, as both of the New York towers fell to the ground. The Pentagon was on fire, and our government’s fate was unknown. The U. S. Capitol was frozen in time as our legislative branch of government came to a chilling halt. We knew there was still another plane in the air; we did not know if it was headed for the dome of the Capitol. As the events of the day continued to unfold, I remembered that just two weeks ago I was traveling with my boss to New York for a tour of the NY/NJ Port Authority, which included lunch in the Oval Room of the World Trade Center. We were given official visitor badges in the WTC (which I still have) and a complete briefing on the security enhancements put in place since the bombings back in the 90s. Our hosts for the day were killed on September 11th. I realize now how very lucky we were as a nation that our Capitol is still standing today. What I witnessed was a horrible tragedy, but could have been far more horrific if Flight 93 had not been taken down by its courageous passengers. I remained at the Capitol after the members of Congress and one staff member were allowed to re-enter the buildings. Later that day there were several conference calls from the Speaker, who had been whisked to an off-site location. My boss joined other members on the Capitol steps to sing “God Bless America” and show the world that our Congress was still in place and the U.S. Capitol still standing. The mandate and challenge to secure our nation from future terrorist attacks was underway. Access to the U.S. Capitol would be changed forever. The tenth anniversary of September 11th, with its commemorations and recollections, is all over the news and in the forefront of our thoughts. In addition to your memories of the day, we’re interested in what you recall about the weeks after the attacks. Were you working or living on the Hill in the fall of 2001? What changes did you notice, around you or within yourself? October brought the anthrax attacks and the passage of the USA PATRIOT Act. Did you work in an affected office? Help write the bill or work on its journey through Congress? Were you responsible for updating your office’s emergency procedures or buying gas masks? Write about your experiences in the comments, or email them to us and we’ll publish them. To start off, here are a few memories from USCHS staff. Our offices are on the Hill, across the street from the Hart Senate Office Building. As many will recall, the VFW issued gas masks to all their employees and employees of the building’s tenants. In addition, the Society brought in an extra supply of water and purchased heater meals (meals that are packaged to last several years and heated with a chemical reaction to water which is supplied in the meal package). We will be able to feed our staff for at least three days (or longer) if we were required to stay in the building because of some event at the Capitol. We have replaced the meals, as their shelf life has expired, several times since September 11, 2001. We also purchased a first aid aid trauma kit for the office.